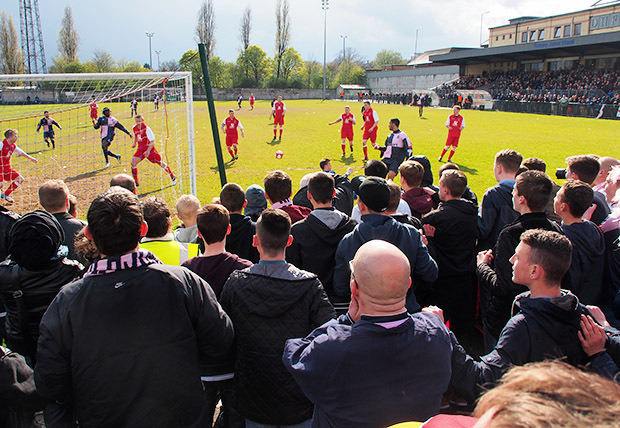 A season’s-best attendance of 1,137 packed out the ground for a game that Hamlet simply could not lose. 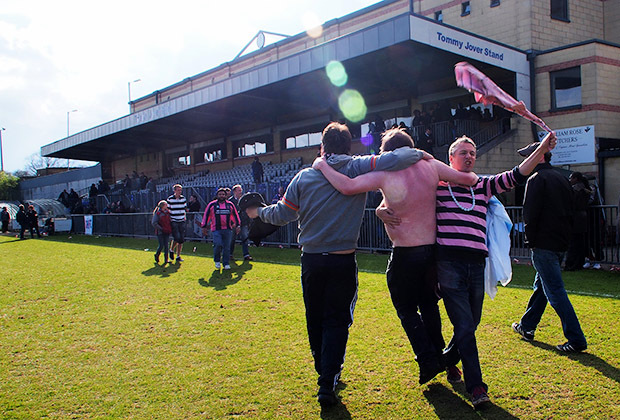 There was a party spirit around the pitch, but given the opponent’s recent form, this game was never going to be a walkover. 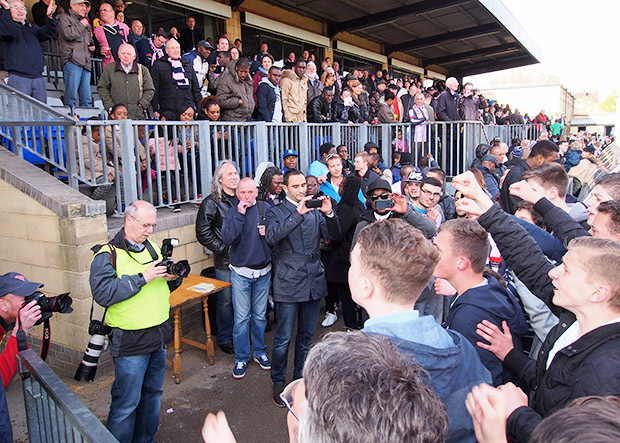 The press were out in force to capture the afternoon’s action. 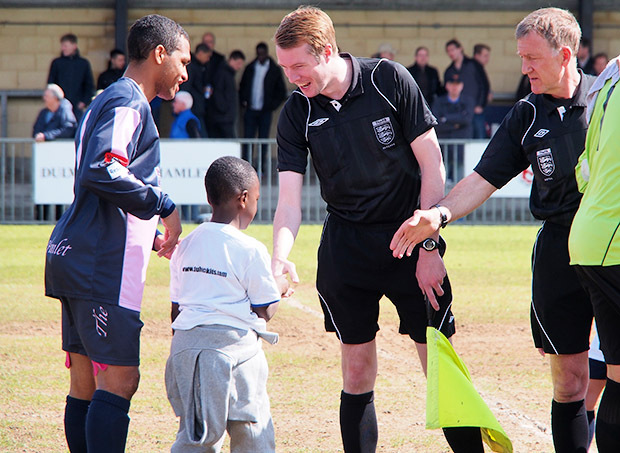 Handshakes before the kick off. 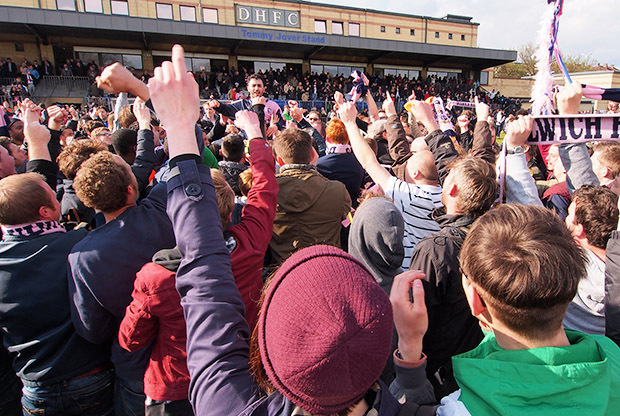 Dulwich looked for an early goal to settle nerves, but failed to make any breakthroughs against a strong and skilful Burgess Hill. 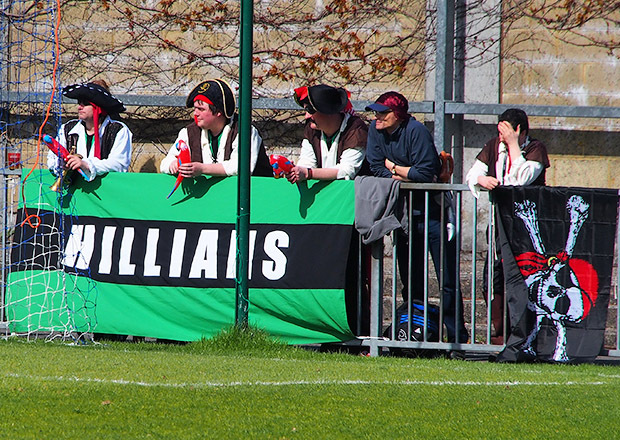 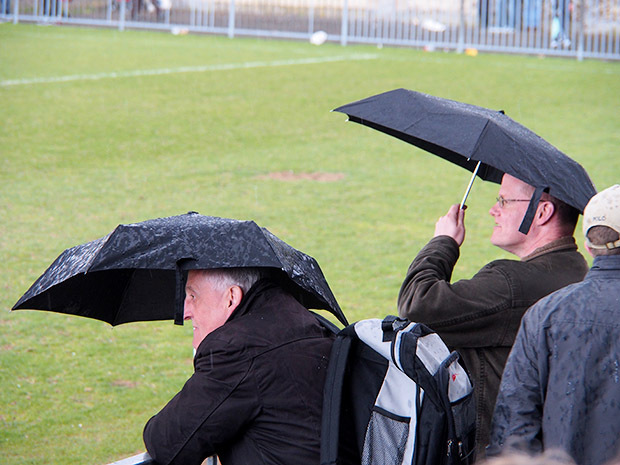 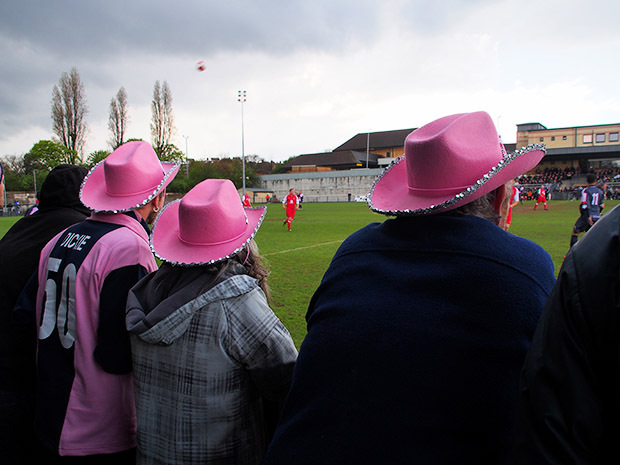 There weren’t many of them, but these Burgess Hill supporters made a fine effort. 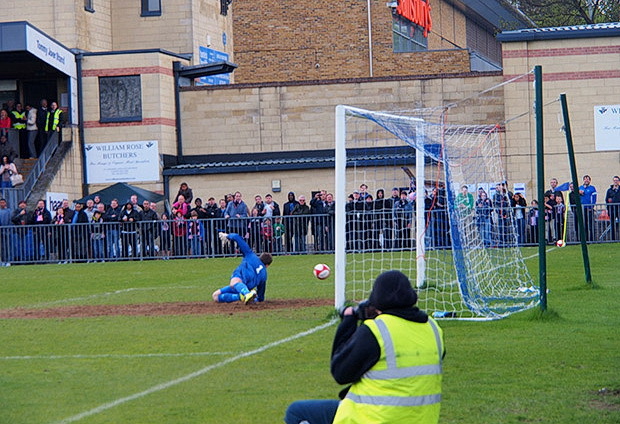 Disaster as Nicky Wheeler scores for Burgess around the half hour mark. 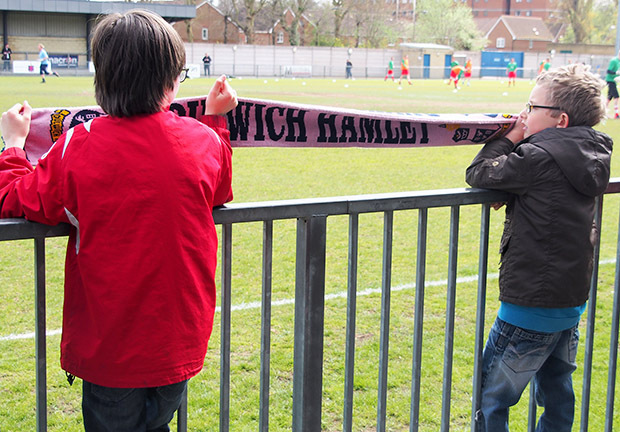 Hamlet tried to respond quickly but couldn’t get the ball in the ruddy net. 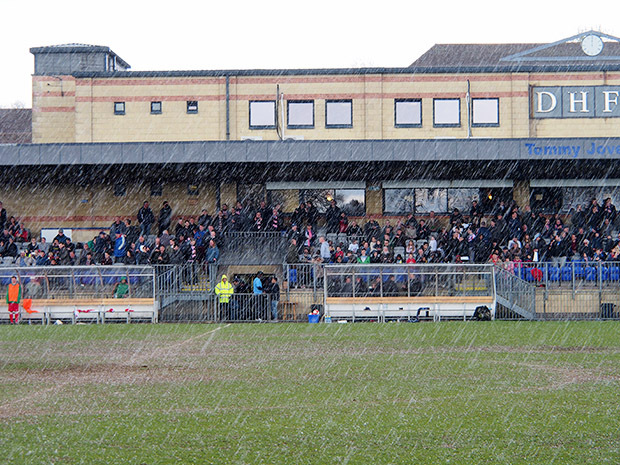 Come half time and a hailstorm of near Biblical proportions rained down on the crowd. 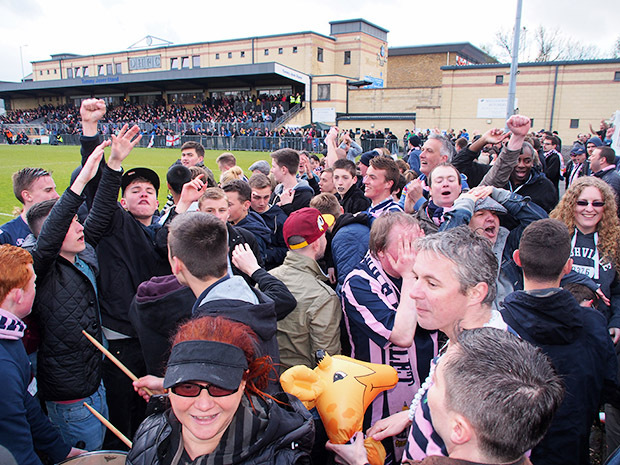 With news of Maidstone winning their last game (and thus clinching the championship ahead of Hamlet) , stress levels around the ground were reaching critical. 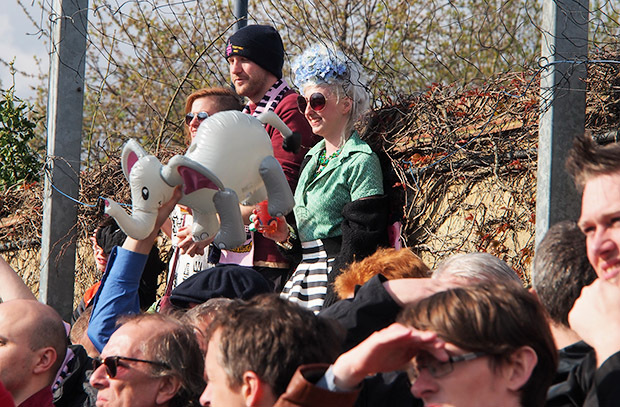 Come on Hamlet! 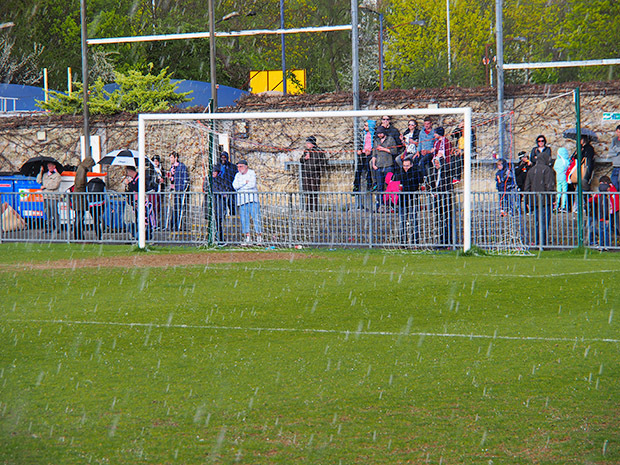 The crowd behind the goal were doing their best to will the ball into the net. 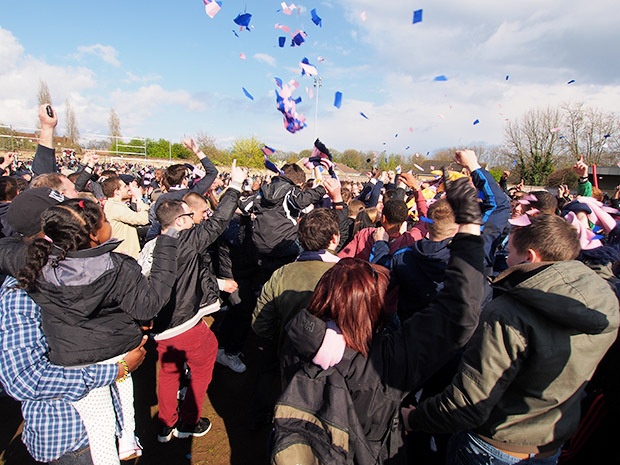 And then – praise be! 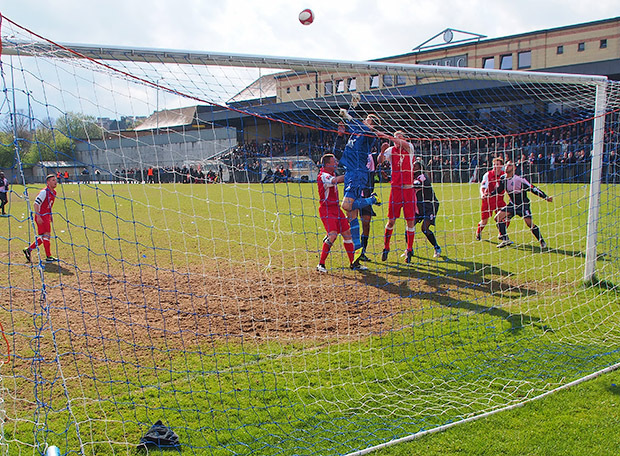 – Xavier Vidal slammed home the equaliser with a 25 year low drive on the 65th minute. 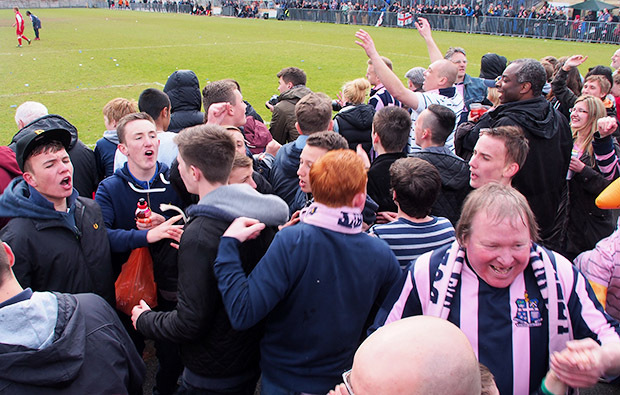 Promotion was back on! 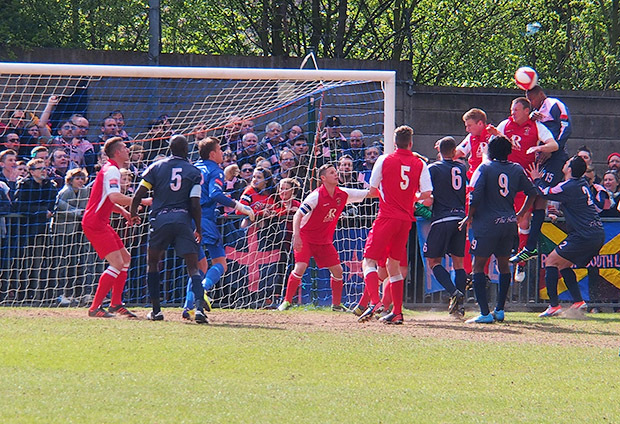 With the score at 1-1, Hamlet seemed a lot more comfortable on the ball and had a couple of good chances. 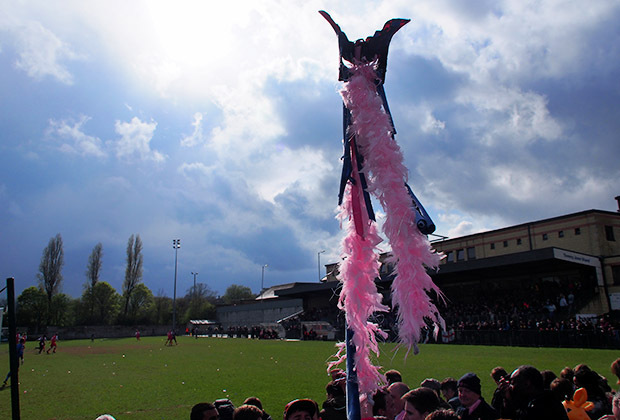 The voodoo stick in action. 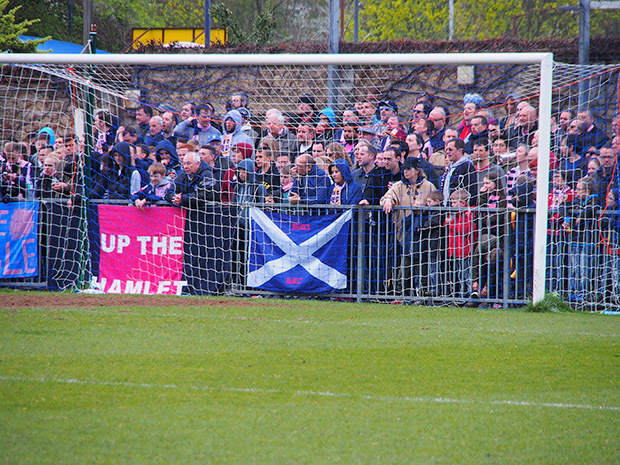 The noise from the Hamlet faithful rose as the seconds clicked down on the clock. 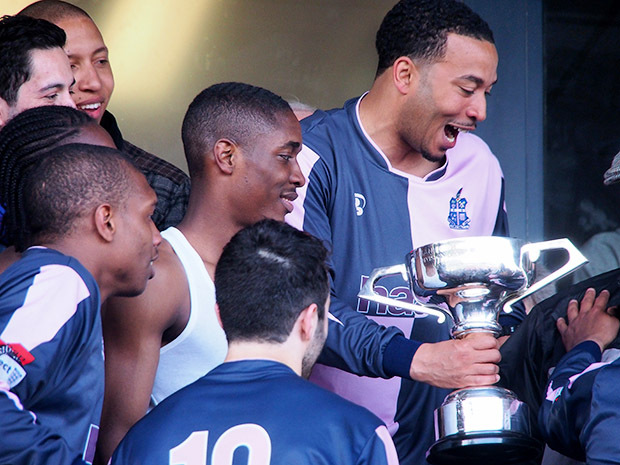 Hamlet kept up the pressure till the end. 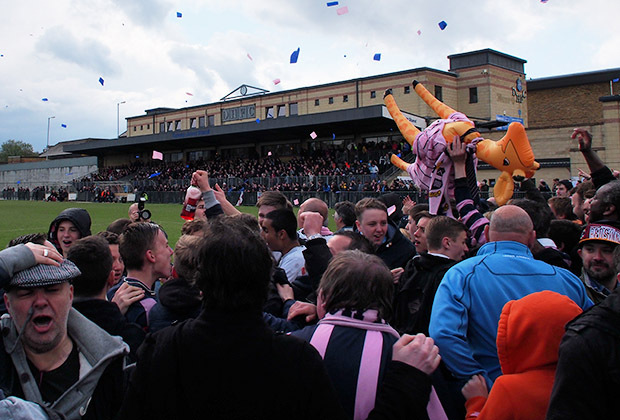 The full time whistle sounds and the crowd stream on to the pitch to celebrate. 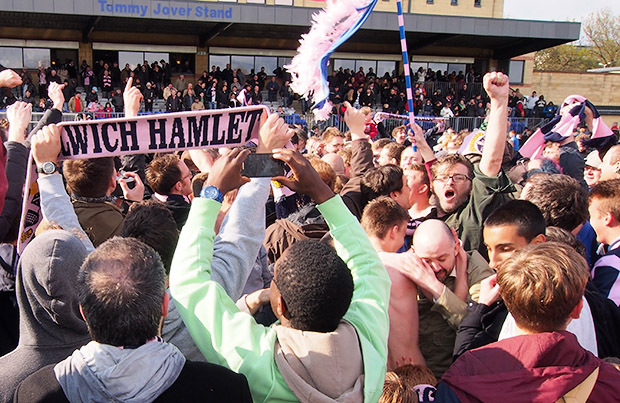 Hamlet are going up! 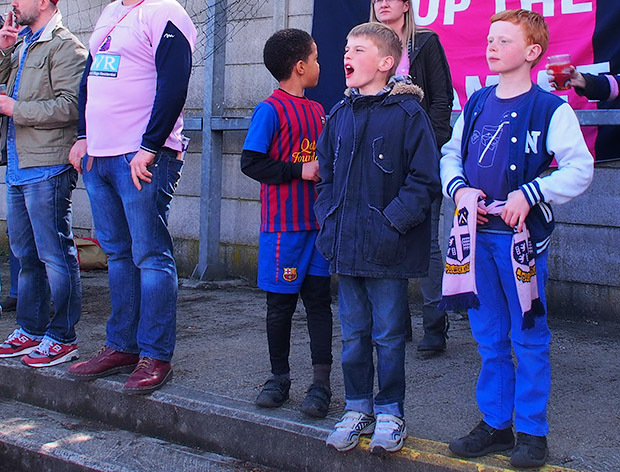 Waiting for the cup to be presented. 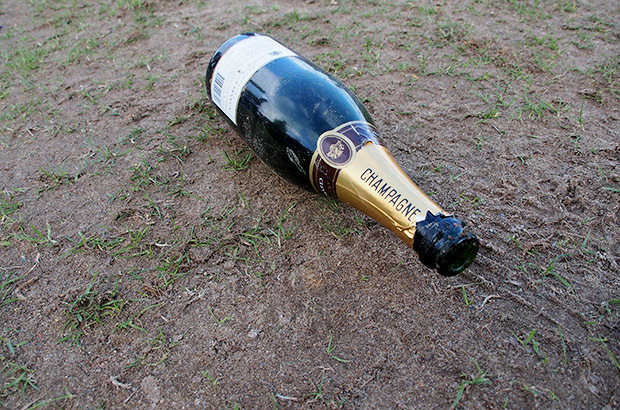 Champagne on the pitch. 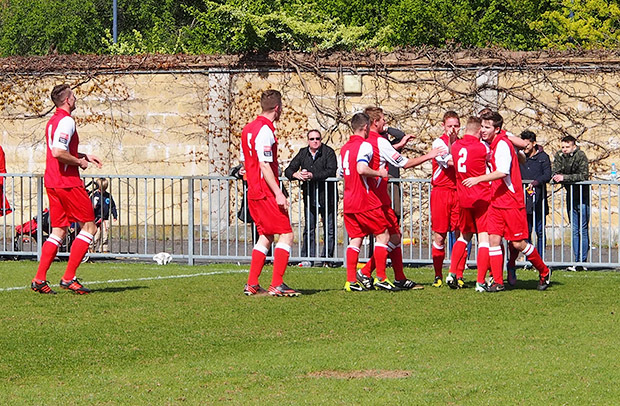 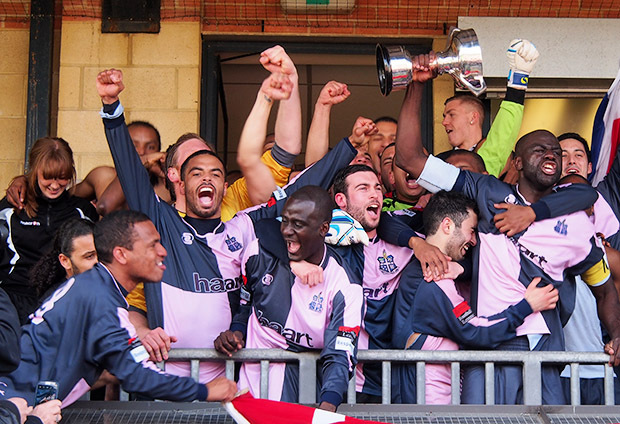 Well done Hamlet – a great achievement for the players, the manager and all those at the club. 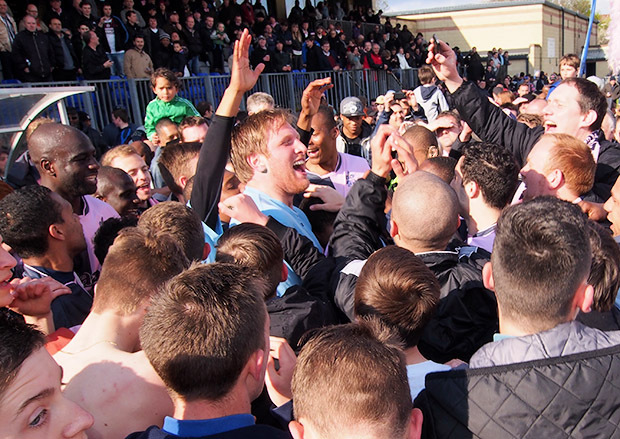 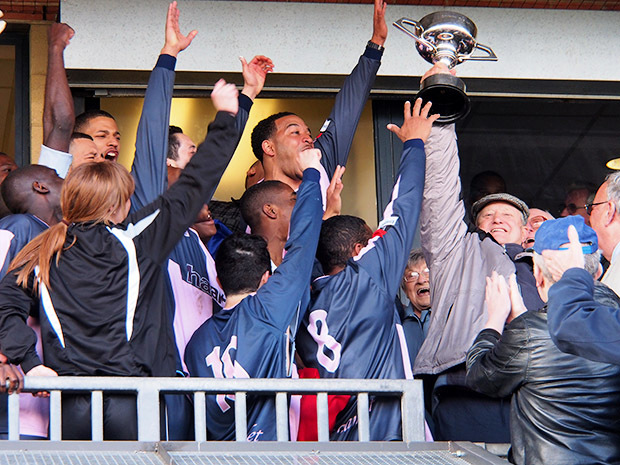 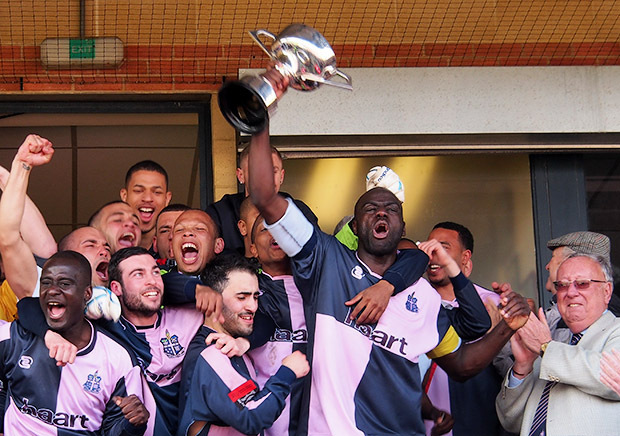 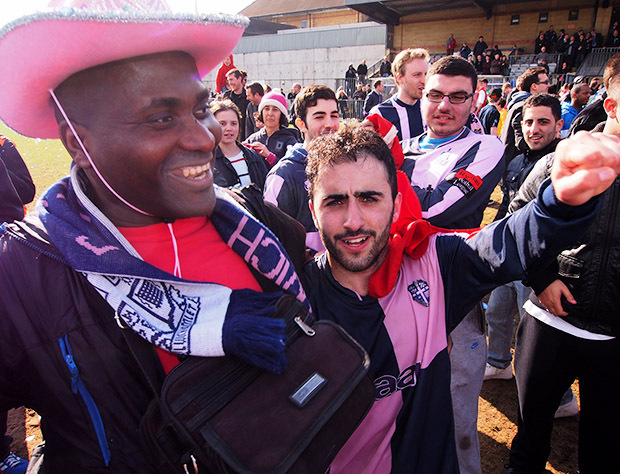 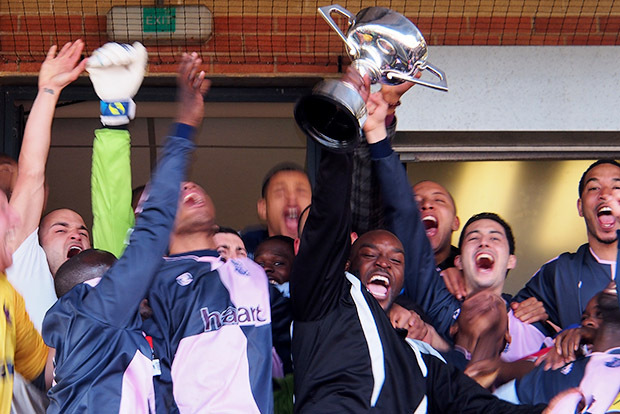 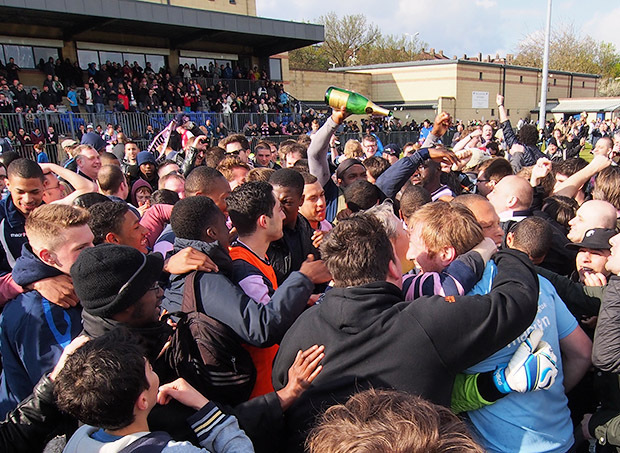 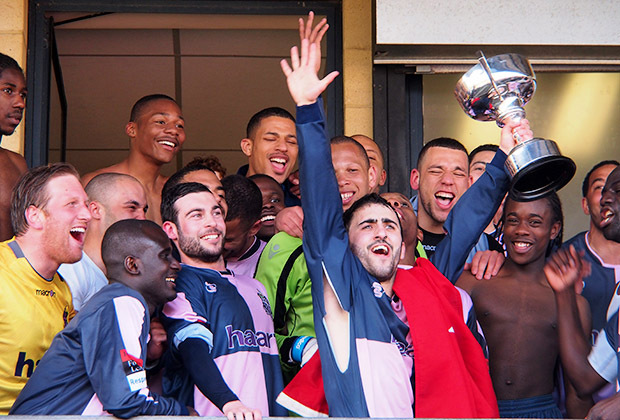 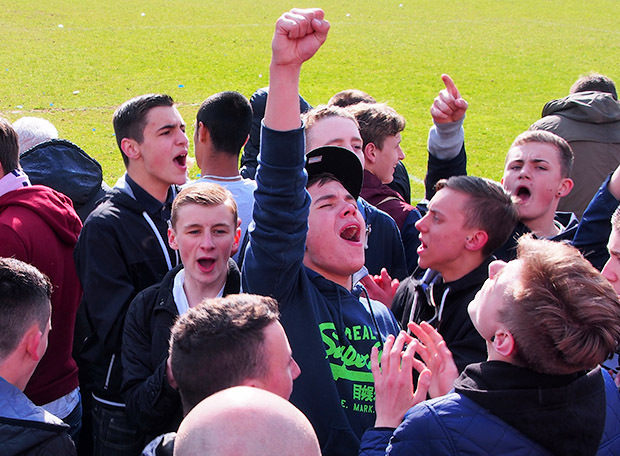 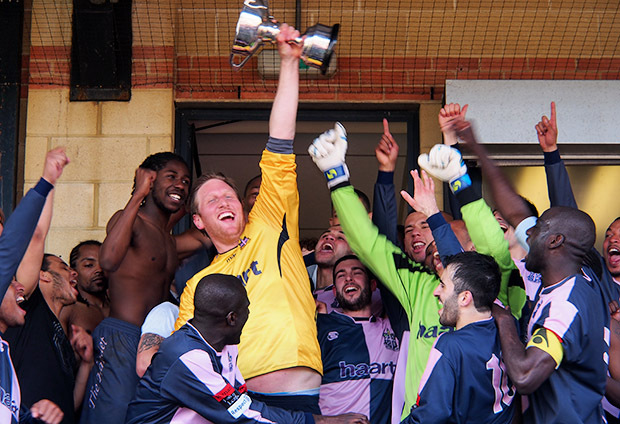 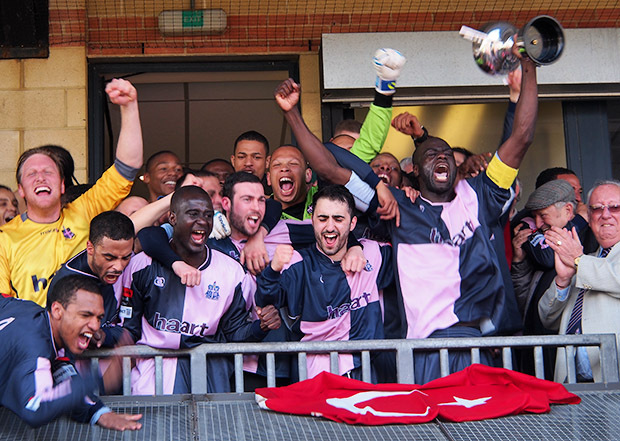 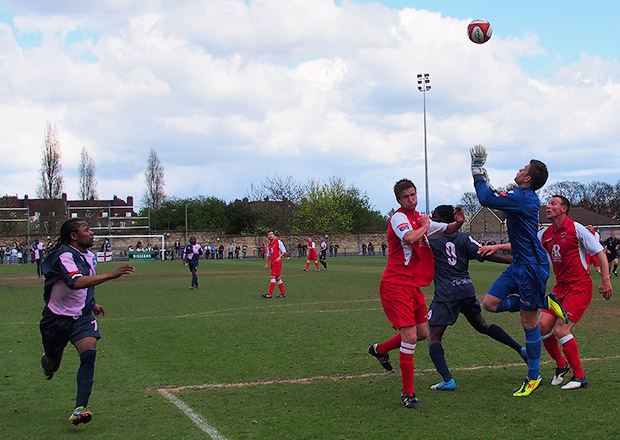 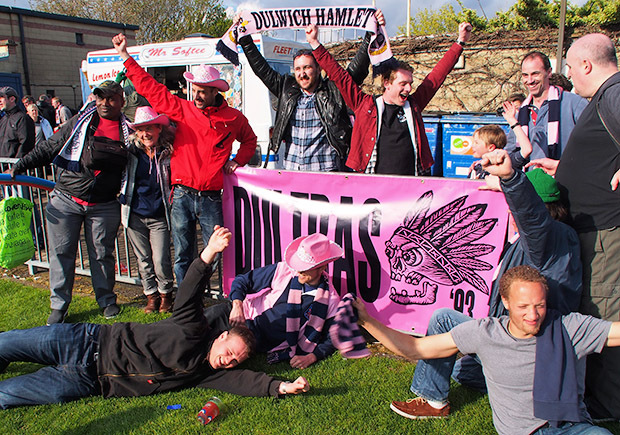 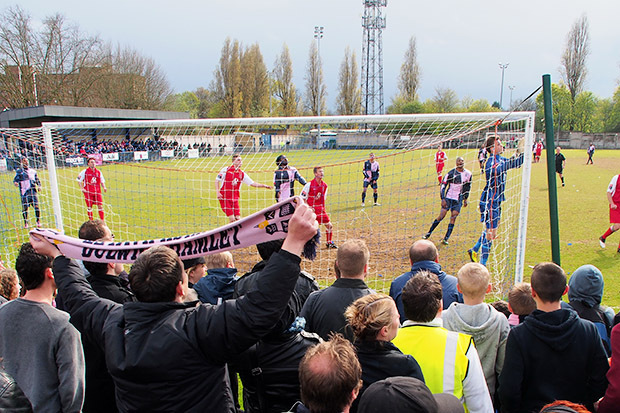 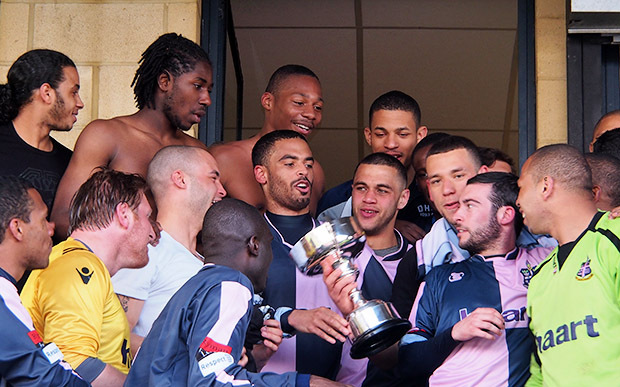 Chat about Dulwich Hamlet on the urban75 forums. 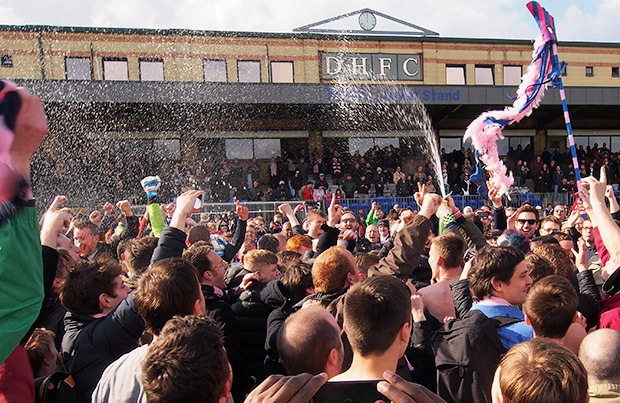 Cheers Damon. 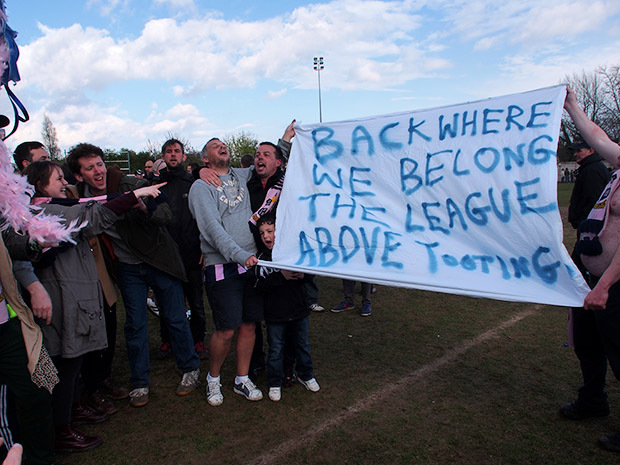 You’re right about Lewes, of course. 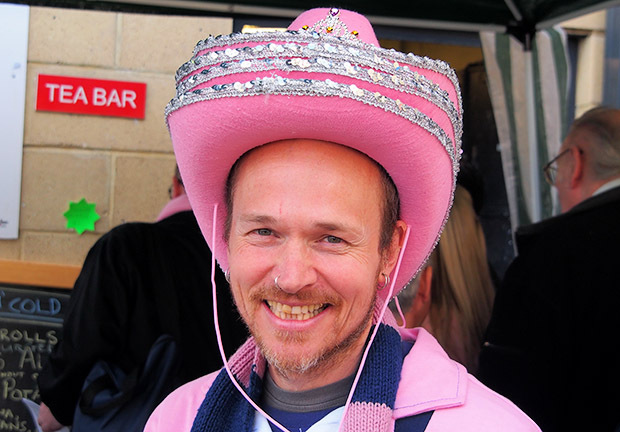 I got confused because when I stayed there years ago, we walked to Camber Sands.